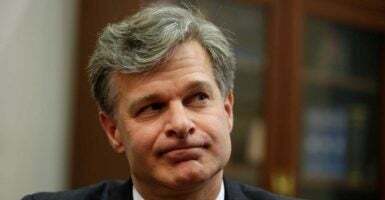 “Chris Wray is extremely intelligent, very principled, very hardworking,” said a former colleague of President Donald Trump’s FBI director nominee in an interview with The Daily Signal. The Senate Judiciary Committee will hold a hearing for FBI director nominee, Christopher Wray, on Wednesday. John Malcom, The Heritage Foundation’s vice president of the Institute for Constitutional Government and Wray’s former colleague, said Wray is a good fit for the job. Wray and Malcolm worked together in the Department of Justice’s Criminal Division in the early 2000s. “I have known Chris Wray for a very long time. … He was my boss … for about nine months in 2003 to early 2004. But I’ve known Chris Wray since the mid-nineties,” Malcolm told The Daily Signal. Wray began working for the Department of Justice in 2001 and eventually served as an associate deputy attorney general, principal associate deputy attorney general, and assistant attorney general of the Criminal Division. Malcom said Wray was a “protege” of Larry Thompson, the then-deputy attorney general, at the Department of Justice. When the then-head of the Criminal Division, Michael Chertoff, left in 2003, Wray became head of the Criminal Division where Malcolm was the deputy assistant attorney general. Malcolm said he remained one of Wray’s deputies until Malcolm left the DOJ in March 2004. “I’m quite confident [Chris Wray] realizes that the FBI is the nation’s chief law enforcement office … I have no doubt he will approach this new job, once he is confirmed, in a thoroughly professional, nonpartisan manner,” Malcolm said. Malcolm said he was confident in Wray’s abilities to head the FBI. “He will be a dedicated, fair-minded FBI director,” Malcolm said. Wray currently works at the law firm King & Spalding and chairs its special matters and government investigations practice group. This group “represents companies, audit and special committees, and individuals in a variety of white-collar criminal and regulatory enforcement matters, parallel civil litigation, and internal corporate investigations,” according to the firm’s website. He previously clerked for former Judge J. Michael Luttig, who was “a prominent conservative on the 4th U.S. Circuit Court of Appeals,” according to Politico. He graduated from Yale in 1989 and from Yale Law School in 1992.